Ekpani (ek paan)means one leaf. 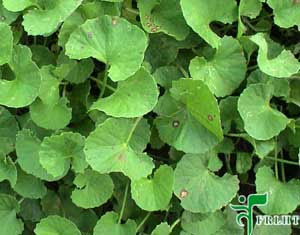 It is known as Brahmi in Ayurveda and its scientific name is Centella Asiatica. It is considered to be a memory booster according to Ayurveda. Read more about Brahmi on Wiki. I brought a Brahmi plant while coming back from our vacation but it did not survive. Then after reading Shilpa's post i adopted her idea of using Watercress in place of Ekpani. Grind all the ingredients in a blender with little water. adjust salt and sugar as per liking. Serve with hot rice and curry. Also check Shilpa's (of Aayi Recipes) version of this Chutney called Ankre Tambli which is a non sweet version.